This study aims to examine the effectiveness of cognitive behavior group guidance in reducing the negative mindset of vocational students. The study was carried out starting from February to July 2018, which took place at the SMK Kepuhdoko Tembelang Jombang. This study used an experimental design with the design of the Pretest and Posttest Design Group. Data were analyzed by Paired Sample Test t-test, obtained the result of tcount was 6,500 and probability number (Sig. (2-tailed) was 0.001 with df = 5. Then the results were compared with the ttable at a significant level of 5% test 2 parties with df = 5, so that the ttable is 2.571 or 6,500> 2,571. The probability value obtained is 0.001> 0.005, so it can be concluded that cognitive behavior group guidance is effective in reducing the negative mindset of vocational high-school students based on the results of the research recommended for teacher`s guidance and counseling. Applying cognitive-behavioral group guidance as one of the alternative help in reducing the negative mindset of high-school students. Furthermore, researchers can use the results of this study to be used as a reference related to cognitive behavior group guidance, and further researchers can use research designs other than one group pretest and posttest design, for example time series design and n single-subject design. Arikunto, S. (2010). Penelitian suatu pendekatan praktik edisi revisi. Jakarta: PT. Rineka Cipta. Depdiknas. (2012). Dokumen kurikulum 2013. Jakarta: Kemendikbud. Dewi, S., Tobing, D. H., & Hizkia, D. (2014). Kebermaknaan hidup pada anak pidana di Bali. 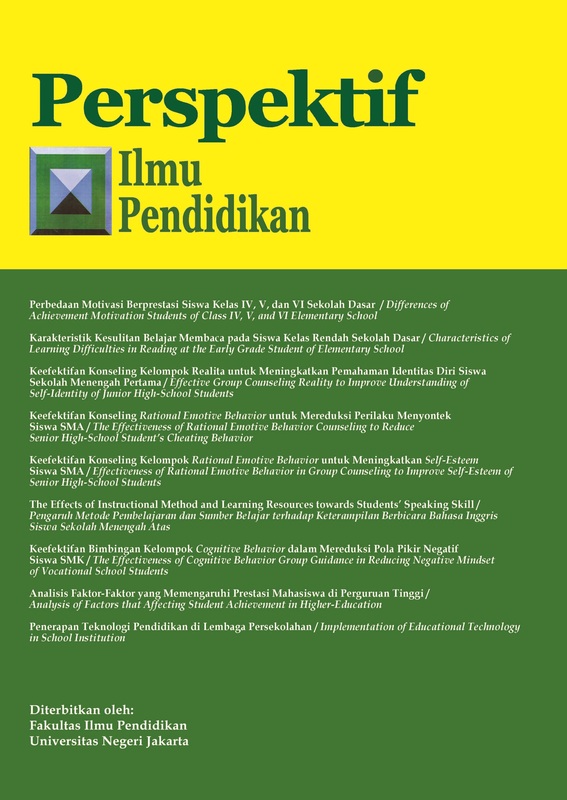 Jurnal Psikologi Udayana, 1(2), 322-334. Elfiky, I. (2013). Terapi berpikir positif. Jakarta: Penerbit Zaman. Hurlock, E. B. (1966). Adolescent development (3rd ed.). New York, NY, US: McGraw-Hill. Matson, J. L., & Ollendick, T. H. (1988). Enhancing children's social skills. Oxpord: Pergamon Press. Rini, J. F. (2002). Memupuk rasa percaya diri. Jakarta: Team e-Psikologi. Wati, S. (2017). Efektivitas pendekatan konseling kognitif perilaku dalam mengatasi dampak negatif alat komunikasi (smartphone) pada peserta didik kelas XI SMK PGRI 4 Bandar Lampung tahun 2015-2016. Tesis. Lampung: IAIN Raden Intan Lampung.